When you imagine fish in the Chesapeake Bay, top predators probably come to mind. But the most important fish in the Bay weighs no more than a pair of playing cards, measures no longer than the width of your hand and is more abundant than any other fish that calls the Chesapeake home. Because it is such an oft-consumed prey item for so many predators, the bay anchovy is considered a forage fish. But the bay anchovy stands out among forage species. Scientists have long known, for instance, that the bay anchovy is a major source of energy fueling the growth and production of predators in the Chesapeake, and can even comprise up to 90 percent of the diets of predatory fish in the fall. A recent investigation into the diets of five predatory fish found that the bay anchovy was the fishes’ most common prey, confirming the bay anchovy is the most important forage species in the Bay ecosystem. 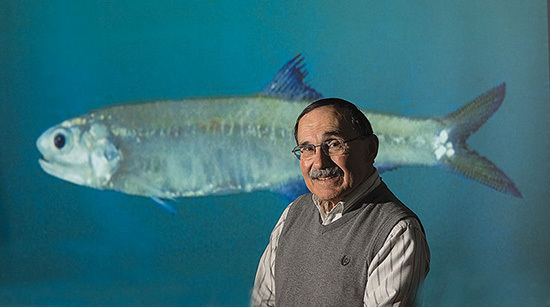 “We’ve studied the production and consumption of bay anchovy in the Chesapeake Bay, and the numbers are impressive,” said Houde, who worked at the University of Maryland Center for Environmental Science’s Chesapeake Biological Laboratory for more than 35 years and served as the institution’s Vice President for Education before retiring in July 2016. 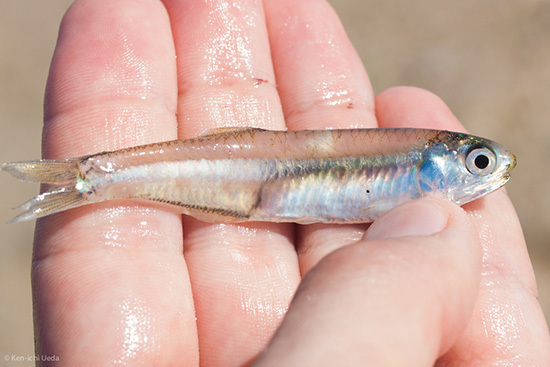 According to Houde, about 50,000 tons of bay anchovy can be found in this estuary at any given time—but an average of 458,000 tons are produced here each year. “That means a huge amount is being eaten and is fueling the production of Bay predators,” Houde said. According to fisheries scientist Ed Houde, several characteristics make the bay anchovy the perfect prey fish. “It’s highly available, it’s the right size and it’s widely distributed over the whole Chesapeake Bay.” Image by Dave Harp/Bay Journal. According to Houde, several characteristics make the bay anchovy the perfect prey fish. 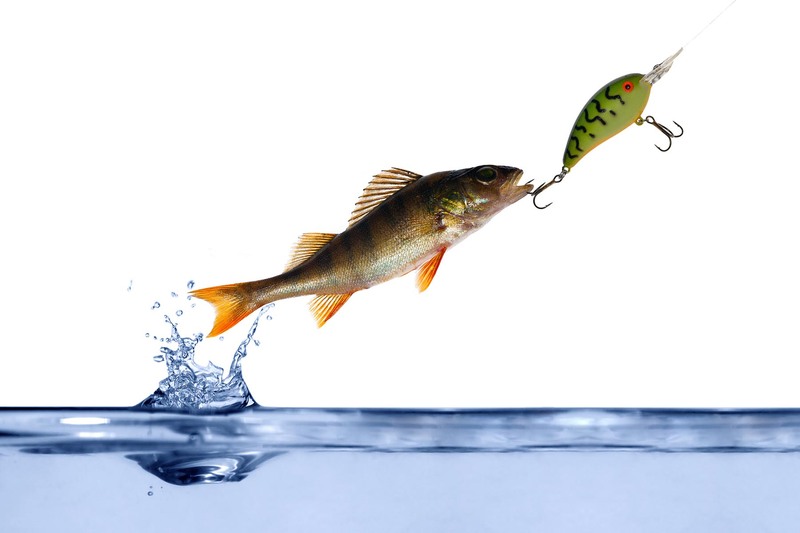 First, it’s a small fish, which means a range of predators both big and small can fit the fish into their mouths. Second, it’s a fecund fish, which means it spawns large numbers of eggs; eggs, larvae, juveniles and adults are eaten by predators. Third, there are a lot of them, almost everywhere, all the time. While other prey species may only inhabit certain areas of the Bay at certain times of year, the bay anchovy is generally available throughout the Bay most of the year. Indeed, the bay anchovy is surprisingly tolerant of both the normal fluctuations observed in an estuarine environment and the hostile conditions that can occur when this environment is stressed. Through laboratory experiments and field work, Houde and his students have found that low dissolved oxygen, for instance, may not impact the bay anchovy like it impacts many other species. 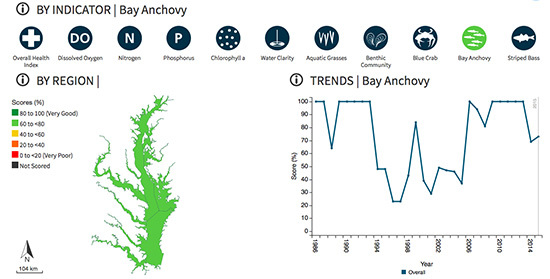 Areas of low dissolved oxygen—which occur in the Bay each summer, and which can suffocate shellfish and other organisms living on or near the bottom—seem to affect the distribution of bay anchovy but not their death rates, driving adults into the lower portion of the Bay. Coincidentally, it is in this portion of the Chesapeake that bay anchovy larvae and young are most likely to thrive. It may seem counterintuitive, but in this way, low dissolved oxygen can enhance the bay anchovy’s reproductive success. The University of Maryland Center for Environmental Science tracks bay anchovy abundance as an indicator of Chesapeake Bay health. The institution has given bay anchovy abundance a Very Good score in its annual Bay report card for eight of the past ten years. Image by University of Maryland Center for Environmental Science. 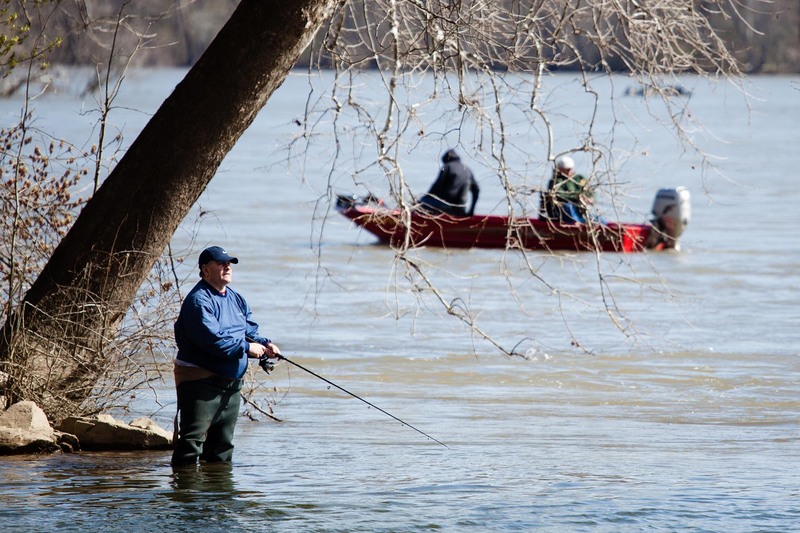 The Maryland Department of Natural Resources and Virginia Institute of Marine Science have gathered survey data on bay anchovy abundance for decades, and the University of Maryland Center for Environmental Science has also tracked this number as an indicator of Bay health. While bay anchovy populations fluctuate seasonally and annually and the fish is less abundant now than in the decades before 1990, Houde does not believe the bay anchovy has declined since the mid-1990s. That said, Houde acknowledges that there must be environmental thresholds the bay anchovy cannot successfully cross. Little research has been done into the effects that chemical contaminants could have on the fish, and environmental conditions that lower plankton productivity—the mainstay of the bay anchovy’s diet—could have substantial effects on anchovy production and abundance. Through the Chesapeake Bay Watershed Agreement, the Chesapeake Bay Program has committed to improving our understanding of the role of forage species in the Bay. Learn about our work to develop a strategy for assessing the Bay’s forage base. About Catherine Krikstan - Catherine Krikstan is a web writer at the Chesapeake Bay Program. 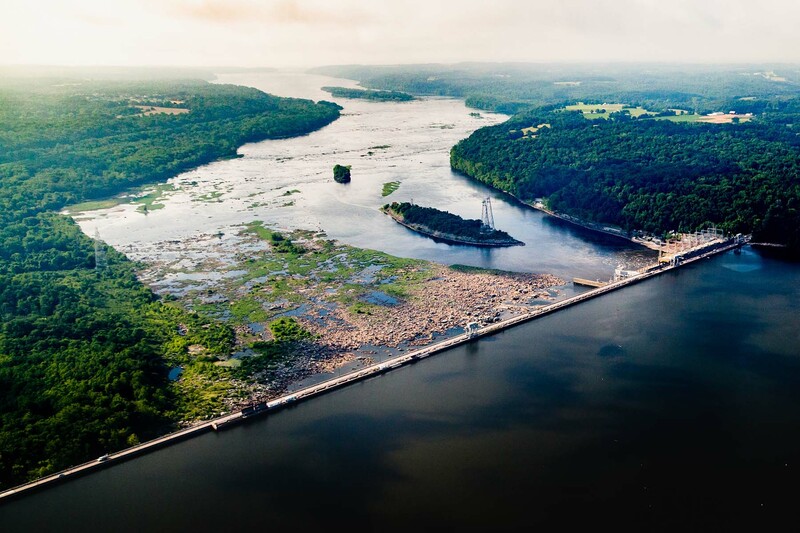 She began writing about the watershed as a reporter in Annapolis, Md., where she covered algae blooms and climate change and interviewed hog farmers and watermen. She lives in Washington, D.C.